The Rehabilitation for Multiemployer Pensions Act offers the best chance of preventing the insolvency of the 121 failing multiemployer pension plans covering 1.3 million workers. Unfortunately, special interest groups have targeted the bill in a bid to derail a federal rescue of troubled multiemployer pension plans. The bipartisan legislation, introduced by House Ways and Means Committee Chairman Rep. Richard Neal, D-Mass., and Rep. Peter King, R-N.Y., in January, is a rebranding of the Butch Lewis Act, introduced in 2017 by Sen. Sherrod Brown, D-Ohio, and co-sponsored by Mr. Neal. The essence of the legislation is a federal loan program that would be administered by the Pension Rehabilitation Administration, a new agency within the Treasury Department. Financially troubled multiemployer plans must not invest the loan proceeds in the stock market. They would be required to use the loans solely to pay benefits to retired workers. Pension plans must use the loans to buy annuities or low-risk investment-grade bonds matching the payout of benefits to retirees. Among the critics of the legislation are the Pension Analytics Group, which released a study in November 2018 that miscalculated the cost and impact of the Butch Lewis Act. Nonetheless, Pension Analytics conceded that the legislation would protect a million plan participants from plan insolvency, reduce the Pension Benefit Guaranty Corp. financial assistance by $62 billion and delay troubled plans' insolvency by an average of 16 years. The Pension Analytics study fails to apply PBGC financial assistance to plans that require assistance in addition to a PRA loan and ignores the anticipated recapitalization of the PBGC under the legislation to support necessary financial assistance to plans that require more than one loan. Finally, Pension Analytics fails to recognize the numerous mechanisms in the legislation that greatly reduce the likelihood of loan defaults. The Pension Analytics analysis also fails to factor in the concept of defeasement, a linchpin of the federal loan program. The legislation mandates defeasement, requiring the loan proceeds to be invested conservatively solely to meet the current retiree benefit obligations. The defeasement investment strategy uses low-risk investment-grade corporate bonds that are cash or duration-matched to pay the retiree pension obligations. 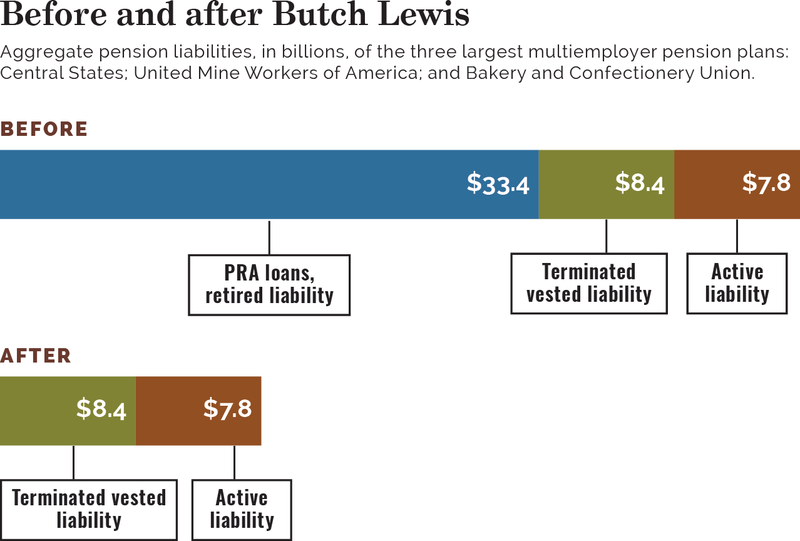 The top part of the graph displays the current financial dilemma facing three of the largest and most troubled multiemployer plans – Teamsters Central States, Southeast & Southwest Areas Pension Fund; the United Mine Workers of America 1974 Pension Plan; and the Bakery & Confectionery Union and Industry International Pension Fund. The liabilities of the three plans total $45.4 billion, with retirees representing $29.2 billion. The lower part of the graph shows the plans' liabilities after the PRA loan and PBGC financial assistance have neutralized the retiree liability and the plans' negative cash flow. The PRA loans allow plans to restore financial solvency by separating the retiree liability from the plan and securing these obligations with low-risk assets. Moreover, the Treasury Department will review and oversee the federal loans. Finally, Pension Analytics ignored that the legislation strengthens plan solvency and reduces the likelihood of loan defaults by tightening withdrawal liability provisions and making it far more expensive for employers to withdraw. Under the legislation, employers would incur withdrawal liability as if a mass withdrawal had occurred if they withdraw from a plan within 30 years of receiving a PRA loan. Congressional staff worked closely with the Congressional Budget Office to write this legislation that would minimize the cost to the federal government while strengthening multiemployer plans and preserving these modest benefits for workers who earned them. It is evident that federal loan programs, as described by the American Academy of Actuaries in the May 2018 issue brief, offer a viable and fiscally prudent solution for underfunded multiemployer plans. David Blitzstein is principal at Blitzstein Consulting LLC, Jeffrey B. Cohen is partner at Bailey & Ehrenberg, Gene Kalwarski is CEO at Cheiron Inc. and Judy Xanthopoulos is principal, Quantria Strategies LLC.